The huge fire which swept Universal Studios in Hollywood on Sunday was started accidentally by workers using a blowtorch, investigators say. The roof of a film set on which they had been working had ignited while they were taking a break, a senior fire official in Los Angeles said. The fire tore through sets at the 400-acre (160ha) site, also damaging a library of videos and film reels. At its height, more than 400 firefighters fought the blaze. Several were injured as they struggled to bring it under control. Universal Studios re-opened on Monday, attracting hundreds of visitors. Los Angeles County fire chief Michael Freeman said the three workers had been fixing the roof of a building facade. They finished the work at about 0300 local time (1100 GMT), and then stood watch for one hour - a standard policy - before leaving for a break. A fire on a streetscape featuring New York facades was spotted by a security guard about 45 minutes later. Meanwhile, a team of investigators is also looking at the poor water pressure in fire hydrants which hampered early efforts to control the flames. Parts of the movie studio's theme re-opened on Monday, attracting hundreds of visitors. On the studios' first tram tour of the day, damage from the fire was clearly evident and the smell of smoke hung in the air. A guide thanked firefighters for their work in battling the flames. 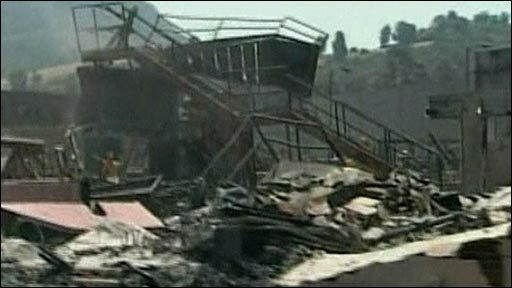 A King Kong exhibit and sets from the films Back to the Future and Bruce Almighty were among the attractions destroyed. However, the head of Universal Studios, Ron Meyer, said the studios had duplicates of everything lost in the video library, and that the main vault containing motion picture negatives had not been affected. Behind-the-scenes tours of the studios are a long-established tradition popular with visitors.